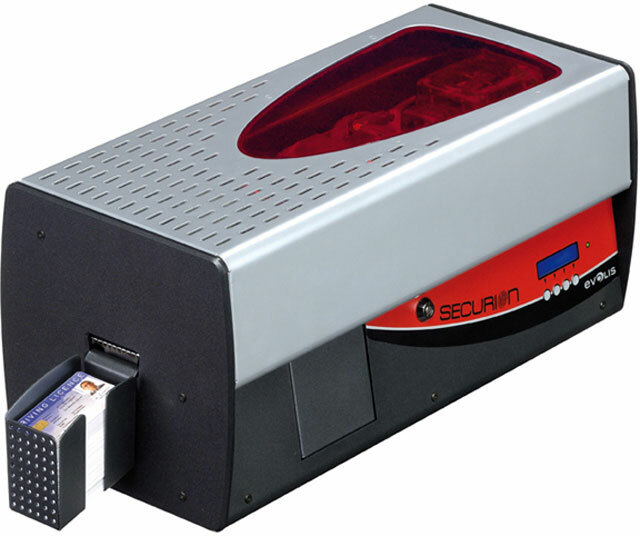 Securion"s next-generation lamination station applies a varnish or patch-based protection film, and also manages holograms whenever required. Securion provides premium protection for badges, when it comes to security and durability. Securion comes with the leading double-sided and color printing module in the market, to match top-quality graphics with striking performances. The Evolis Securion supports advanced encoding options that can all be combined to cater to any specific encoding requirement, including the most sophisticated. Securion deploys additional layers of security to guarantee safe operation with a central locking system that prevents access to consumables (cards and ribbons) and password-based access to the machine. Thermal transfer, Laminator, Basic, 300 dpi, Color Single-sided Printing at 115 cards/hour, 2.125" card width, USB + Ethernet Interfaces, 16MB RAM. Includes: Printer, Power cord, USB cable. Thermal transfer, Laminator, Smart card Contact Station, 300 dpi, Color Single-sided Printing at 115 cards/hour, 2.125" card width, USB + Ethernet Interface, 16MB RAM. Includes: Printer, Power cord, USB cable. Thermal transfer, Laminator, Smart Contact, Omnikey, 300 dpi, Color Single-sided Printing at 115 cards/hour, 2.125" card width, USB + Ethernet interface, 16MB RAM. Includes: Printer, Power cord, USB cable. Thermal transfer, laminator, MagISO, Smart contact + contactless, Dualchip encoder, 300 dpi, Color Single-sided Printing at 115 cards/hour, 2.125" card width, USB + Ethernet interface, 16MB RAM. Includes: Printer, Power cord, USB cable. Thermal transfer, laminator, MagISO, contactless, Dual HiCo/LoCo encoder, 300 dpi, Color Single-sided Printing at 115 cards/hour, 2.125" card width, USB + Ethernet Interface, 16MB RAM. Includes: Printer, Power cord, USB cable. Color Ribbon 5 Panel YMCKO, 200 Prints. Compatible with Pebble & Dualys printers.